A wonderful, beautifully styled & easy to grow Sweet Plum bonsai tree kit which is perfect for beginners to get started. Potted into a pretty ivory/cream ceramic bonsai pot with matching drip tray. Includes Merry Christmas Foil Balloon care instructions & festive Merry Christmas Tag. A highly recommended gift with free delivery to most areas. The shape of this beautiful bonsai is well defined and strong. Lovely reddish trips to the new foliage and small purple fruits as the bonsai matures. Always a favourite. You can add gift wrap or a message below. A fabulous indoor bonsai kit with a wonderful fruiting Sweet Plum S-Shaped bonsai tree, drip tray & red star shaped Merry Christmas tag. 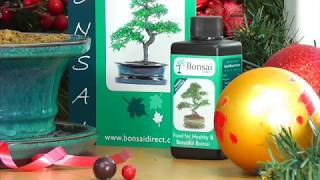 Ideal choice if you are looking for a vigorous bonsai which is easy to grow and perfect for beginners. Please note that all bonsai are individual and some slight variation from the photograph should be expected; the photograph is a good representation.